What Should John Murdoch Do at the End of Dark City? Much has been said about 1998’s Dark City. Other people have analyzed its similarities to 1999’s The Matrix, fawned over its rich marriage of murder mystery and science fiction, and explored its deeper meaning and symbolism. But there’s one aspect of the film that I’ve never heard discussed, and that’s what happens after the end credits roll. Spoiler alert to anyone who hasn’t seen this amazing film before. 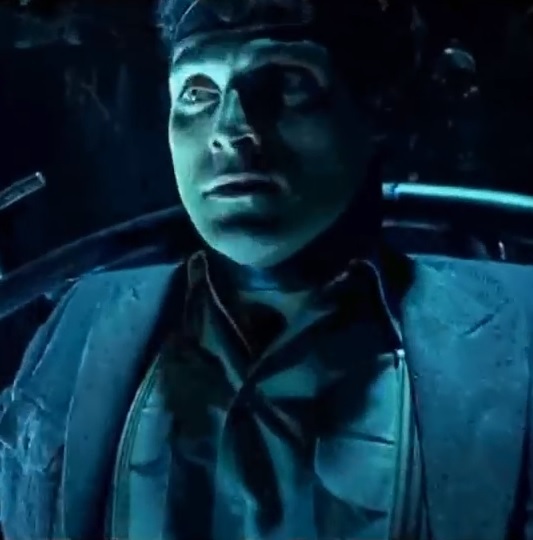 At the end of the film, the main character (John Murdoch) learns that the city he is living in was actually created by aliens, known only as the Strangers, who are experimenting on the human inhabitants in search of the secret to the human soul, which they hope will preserve their dying alien race. No one is who they think they are. They have all been implanted with false memories and lives, and they have no hope of ever finding their true home because every memory of Earth was taken from them. John receives Godlike powers over the machines that the Strangers use to control the city, and he uses those powers to defeat the Strangers and restructure the city to his liking. He lines the outside of the city with water to create the Shell Beach that has been one of the few bright spots in his fake memories, and then he proceeds to meet up with the woman who was his wife in a former life, but who now has no memory of him. Bad guys defeated. Good guy gets the girl. Happy ending, right? Well, everyone in the city is still stranded who knows how many light-years from Earth with no clue how to get back there or even what it’s called. There are a lot of questions I have about what John Murdoch should do at the end of Dark City. Let’s go through them. Is it better for everyone in the city to continue living in ignorance for the rest of their lives or should John tell them the truth? They could go through their entire lives without being the wiser about their true situation. People would have children and hopefully find some kind of contentment in their lives. But maybe their kids would suffer from the same fever as Truman Burbank to escape the phoniness of their prison and they would learn the truth on their own. If he does decide to tell the people, should it be on a personal level, making friends with individuals and spreading the word slowly so as not to cause widespread panic or mental breakdowns? Or should he get on every radio and TV to tell all the people at the same time that they are living a lie? Either option is not a pretty picture. I think he should tell everyone the truth. People are smart, and it’s better to err on the side of information. Sure, it will cause all kinds of problems at first, but in time it will cushion the blow much better than trying to maintain the lie. John should start with his former wife who is now named Anna. He should relate to her the sad story of how they were taken to this city against their will and his struggle to free himself from the evil persona they tried to place upon him until he finally discovered the truth. If she still loves him after learning all of this, she can be a big strength to him in leading the people to create a peaceful society. Once people know the truth, they will most likely want to know why they should continue to do their jobs when they could all be done without them. Trains and cars could be run automatically while manufacturing is redundant when food, goods, and buildings can be created out of nothing with a wish. Should John automate every aspect of people’s lives? This could quickly devolve into the same problem humans faced on the Axiom in Wall-E. People need goals, jobs, work ethic, and other challenges to give their lives meaning. Even though it might seem counterintuitive, I think John should automate most things to help people be comfortable and take care of their basic needs. The reason I say this is because there is definitely a higher work for people to perform, if they’re up to the challenge. This is a tough one. John isn’t going to live forever, so he will have to teach others how to tune in order to allow them to survive across future generations. But who to teach – there’s the rub. Perhaps he could only teach his children and create a de facto kingly lineage. Or he could democratize the power and give anyone who wants it the power to do it and trust that everyone will use it for good. This could create chaos because not everyone is as skilled or as pure of heart as others, and so such great power could be used for evil in the wrong hands. Of course, everyone’s personality has been imprinted upon them, but I think there is still some residual parts of their original humanity that shine through the artificial parts the Strangers gave them. I would suggest some kind of voting system whereby the people choose the best among them to receive the training on how to tune the city’s machines. Then those people would be benevolent rulers. It’s not a perfect system, but at least it would have a sense of fairness. With his Godlike powers, John could easily turn the city into a paradise for all of its inhabitants. Would that be wise to do? In our imperfect state on Earth, even God himself doesn’t impose a perfect life upon us. Mortal life is meant to be a testing period. However, the Strangers’ idea of testing was to turn humans into mice in a maze. That’s a hopeless existence that can change on a whim. I say, give as many people as possible the power to make life as rich and fulfilling as possible. And then, who knows? Maybe some will attain such a high level of knowledge and understanding in the art of tuning that they will figure out how to improve upon the alien technology and build their own cities away from the original one. Then people who want to go to their idea of an ideal society will join them. Try to Find a Way Home? I think everyone feels a yearning for home, whether it’s the place of their birth or the place they lay their head at night. We all feel a pull toward the place we belong. It’s natural that the people in the city will eventually want to know where they came from and if they should try to find a way back there. It’s basically impossible to return to Earth, so I don’t think there’s any point in trying. John and his fellow inhabitants will have to content themselves with being unintentional pioneers in a new area of space. Take Revenge on the Strangers? It’s left vague as to whether or not many of the Strangers survived John’s assault on their leader. Would it be just for the people in the city to seek revenge on the Strangers for kidnapping them and sentencing them to a life of confusion, false identity, and imprisonment far away from their home? Yes. But there’s no need to take such action. The Strangers had no idea what kind of hornets’ nest they were kicking when they tried to tame the human soul and make it bend to their will. John proved that any random human is more than a match for their greatest warriors. And if the city is protected by dozens or even hundreds of such powerful individuals, the Strangers would do well to keep their distance. The Strangers are doomed to die out anyway, and humanity was their last hope at survival. The people should just let them die out, knowing their plan to enslave them was all for naught, and use the aliens’ power (which they wielded for nefarious purposes) for good. Those are my thoughts on what John Murdoch should do at the end of Dark City. Hopefully they would lead to a bright future. I’d be interested to hear what you think he should do in these situations and in other ones I didn’t even think of. The image is the copyright of its owner. This entry was posted in After The End and tagged dark city, films, movie review, movies, science fiction, the matrix. Bookmark the permalink. 1 Response to What Should John Murdoch Do at the End of Dark City?